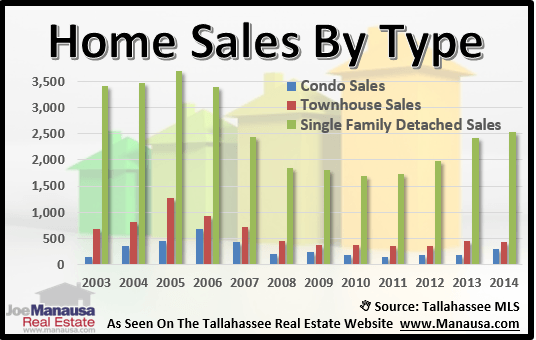 Today we will put 2014 to bed with a year end review of the Tallahassee real estate market. It was a good year, as home sales were up 7% over 2013 and it was the second year of growth in home sales for Leon County, Florida. 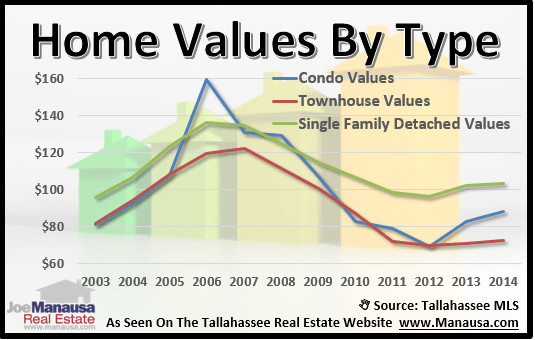 So take a look at six graphs that demonstrate key real estate trends in Tallahassee. We track three different types of residential properties in this first real estate graph. Single family detached homes are shown in green, townhouses are reported in red, while blue represents condominium sales each year. Single family detached homes reported their best year since 2006, continuing a trend of recovery that began back in 2010. Townhouse sales dipped slightly and condominium sales were the best we've seen for the past seven years. 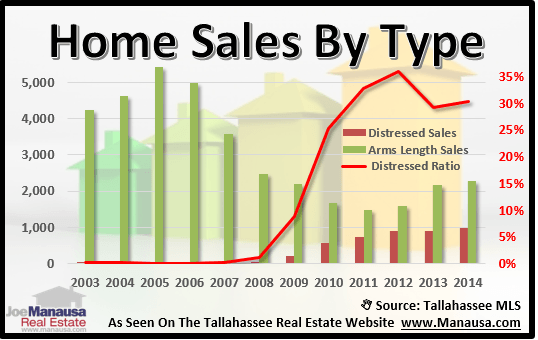 We also like to track the density of distressed home sales in the market (distressed sales are short sales, foreclosures, and pre-foreclosures reported in the Tallahassee MLS). In the graph above, the green bars measure the number of arms length home sales while the red ones measure distressed home sales. The red line measures the ratio of distressed home sales to all home sales and is recorded on the right vertical axis. Last year, 30.4% of all home sales were reported under distressed conditions, a slight rise over the 29.2% reported in 2013. Currently, we expect this percentage and total number of distressed closings to decline in 2015, as the listings entering the market are showing a decline in distressed homes. When we look at average property values each year, we find all three property types improved in 2014. The average condominium value shot up 7%, from $83 per square foot in 2013 to $88 per square foot in 2014, but this was heavily influenced by the rejuvenation of the downtown condo market. Townhouses rose 2%, from $71 to $73 per square foot, while single family detached home values rose 1%, from $102 to $103 per square foot in 2014. The past couple of years has shown a widening in the gap between the value of arms length home sales and the values of distressed home sales, but 2014 saw a minor reversal of this trend. Arms length home sales recorded a 2% rise in values, while distressed home sales reported a 4% rise in values over 2013. This was the first year since 2011 that distressed home values rose over prior year results. Average home prices rose last year too. The average price of a condominium rose to $99,091, the average price of a single family detached home was $211,111, and the average townhouse price was $93,370. The fact that price movement and value movements were so similar is likely due to the fact that mortgage interest rates remained near all-time lows. Finally, when we look at average home prices and compare arms length sales to distressed sales, we find that distressed homes declined in price by 1%, while arms length prices rose 1%. 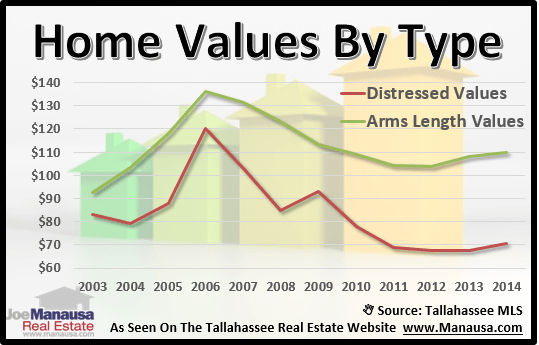 The average price of a distressed home in Tallahassee last year dropped to $112,476, while the average price of an arms length home sale was $217,358. This suggests that the bulk of the distressed market lies in properties that are most active as rental properties. 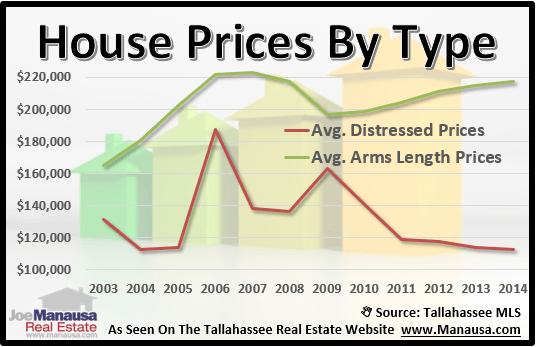 In other words, the lower end seems to contain the bulk of the distressed properties for sale in Tallahassee. If you like knowing what is going on in the Tallahassee real estate market, why not subscribe to our free newsletter? Every monday, receive a one-page report that features a graph and an explanation of what it means for homeowners, homebuyers, and home sellers. 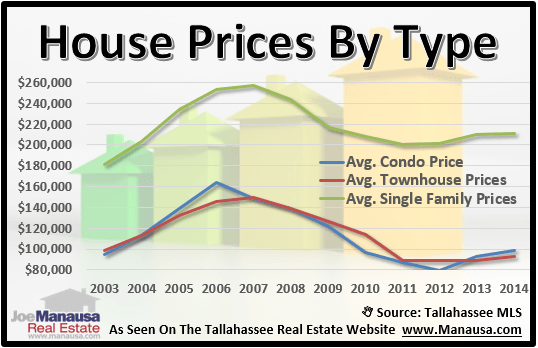 Once a month, the report expands to 9 pages of charts, graphs, and analysis of the Tallahassee housing market.